If you started contributing to an Irish pension in the past ten years then I offer you my commiserations. 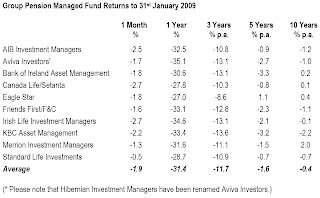 As the chart shows - from data published today by Rubicon Investment Consulting - the average Irish pension fund has, on average, lost 0.4% per annum since January 1999. They have lost 31% in just the past twelve months. Listen out for the howl of anger as the pension contributors of Ireland - the New Poor - read their annual statements arriving in the post over the coming weeks. Nor will there be much consolation in knowing that the present crisis has destroyed 40% of all the world's wealth so far - and it isn't over yet. For all that, today is a good day for Irish workers. The belated demise of Social Partnership (Ireland's unique experiment in Catholic Corporatism) is to be very much welcomed by workers and taxpayers. The end of Partnership is good for both private sector workers and public sector workers (though the latter may not be so appreciative right now). For private sector workers the decision by the Government to impose a pension levy on public sector workers is a small but significant step towards fairness and equity between both sectors. Though many will see the levy on the public sector as - effectively - a pay cut of up to 10% for those on the highest salaries, it pales beside the 100% pay cuts being imposed on thousands of private sector workers every week in the form of redundancy and unemployment. And that's the good news for public sector workers: no redundancies - the right decision in the circumstances (and one I predicted last July). Nevertheless today's announcement by the Government still leaves the public sector with index linked, taxpayer guaranteed pension entitlements that are striding in the opposite direction to that of private sector pensions right now. The debate on how best to resolve what some in the UK are calling Pensions Apartheid (pdf) has still to be addressed. It won't be this year, nor maybe next, but social justice for private sector workers demands that it eventually must be addressed. We're assuming, of course, that public sector workers will simply go along with the Government's plans without recourse to industrial action. Perhaps - though I wouldn't bet on it. The reality is that the public sector in Ireland lives in a world in which there are effectively no economic consequences for their actions - one reason why ICTU (and especially the public sector unions that dominate it) preferred to say 'no' than reach a deal. Ironically I expect that the biggest victims of the demise of Social Partnership will be the trade unions. Only 20% of private sector workers are members of trade unions (a proportion probably declining as the industries in which there are organised are among those contrasting fastest). It looks like the Left will have to figure out a new role for unions - and fast. There is one that I see for them (genuinely): as lifetime coaches, trainers and income insurers for employees who will have to change jobs more often. They might even do a better job as pension advisers and managers. But that may be a 21st century bridge too far for organisations sadly moribund in 19th century practices. I was delighted to hear the news this morning that the so-called "National Recovery Talks" had failed. Social Partnership has been a long-running scandal in Irish society, one that has allowed FF-led governments to duck hard decisions for the best part of twenty years while allowing unelected trade union leaders to effectively dictate economic policy while disguising (with a large amount of help from their left-leaning buddies in RTE) their pursuit of their own sectional interests. Wasn't it great to see the government make a decision today? 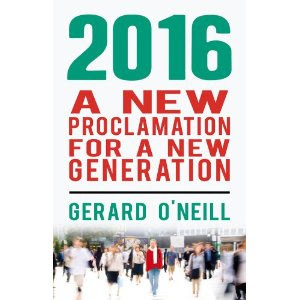 Wasn't it even better to see that this decision didn't have the imprimatur of the bearded denizens of Liberty Hall? Now that they've made an important economic decision all on their own, who is to say that they won't develop a taste for it? Today's shocking unemployment figures did not stop Joe Duffy's show leading with a bleating public servant bemoaning their loss of €1000 per year. As you say in your post many private sector workers are making a 100% pay cut - an extra 36,000 in January alone - who's speaking for their interests? The persecution complex among these detached public servants makes me despair for how we will make the additional cuts we need to get back on an even-keel. Yes indeed. Yet the media hasn't picked up on this meme of the "death of social partnership approach", and certainly, the unions are not calling it this. I think the Unions et al, will regret the failure of the talks because it will be the last time they will have as big an oar in the government boat. Isn't the shocking performance of the private sector pensions an example of the Principal-Agent problem? I sit in a building with private pension brokers - about 1 rung up on the ladder from estate agents and car dealership salesmen!